Trent Frederic scored four times in leading the United States to a 9-3 victory over the Czech Republic in the world junior championship bronze-medal game Friday in Buffalo. Kieffer Bellows one-upped Jeremy Roenick, Trent Frederic scored four times and the United States has a bronze medal to show for it. As consolation prizes go, it wasn't a bad haul for the U.S., which rolled to a 9-3 victory over the Czech Republic in the bronze-medal game at the world junior championship on Friday in Buffalo. "You see the resilience in our group," captain Joey Anderson said of how the defending champion Americans shook off the disappointment of a 4-2 semifinal loss to Sweden a day earlier. "The staff, they make sure the kids know there's a great deal of pride in medaling. Even though it's not gold, this bronze medal means a ton." Bellows scored twice, including once on a penalty shot, to up his tournament-leading total to nine goals. That's one better than Roenick — the former 18-year NHL veteran and USA Hockey Hall of Famer — scored at the 1989 world juniors. "My success came from all my great teammates," said Bellows, the son of former NHL star Brian Bellows, and who was selected by the New York Islanders in the first round of the 2016 draft. "Had a lot of fun the last two years, and it's going to be tough to never come back to this"
Then there was Frederic, who fell one goal short of matching a U.S. single-game junior tournament record. Wally Chapman scored five times against Switzerland in 1984 and Chris Bourque had five against Norway in 2005. Anderson and Patrick Harper had a goal and assist each, and Ryan Poehling also scored in a game the U.S. built a 7-0 lead through two periods. The Americans earned a medal for a third straight year to mark the nation's longest streak in tournament history. The U.S. also finished third in 2016, while upping its medal total to 11 (four gold, one silver and six bronze). Two of the third-place finishes coming in Buffalo, where the tournament was also held in 2010-11. Sweden faced 16-time champion Canada in the gold-medal game Friday night. Radovan Pavlik had a goal and assist, and Martin Kaut Daniel Kurovsky also scored for the Czech Republic. Despite the loss, the fourth-place finish was the nation's best since winning bronze in 2005. "Yeah, it was good, but we wanted to be better," said Filip Zadina, who finished the tournament with a team-leading seven goals. "We wanted to bring the medal to the Czech Republic and we didn't. We are sad." Czech Republic Goalie Josef Korenar allowed three goals on 16 shots before being pulled after Brady Tkachuk's centring pass banked in off Anderson's skate 4:18 into the second period. Korenar then returned for the start of the third period and stopped nine more shots after backup Jakub Skarek allowed four goals on 12 shots. The Americans took control by building a 2-0 lead after Frederic and Poehling scored short-handed goals 13-seconds apart spanning the first intermission. Frederic opened the scoring by stripping the puck from Martin Kaut at the U.S. blue line and then beat Korenar through the legs on a breakaway with 4 seconds left in the first period. 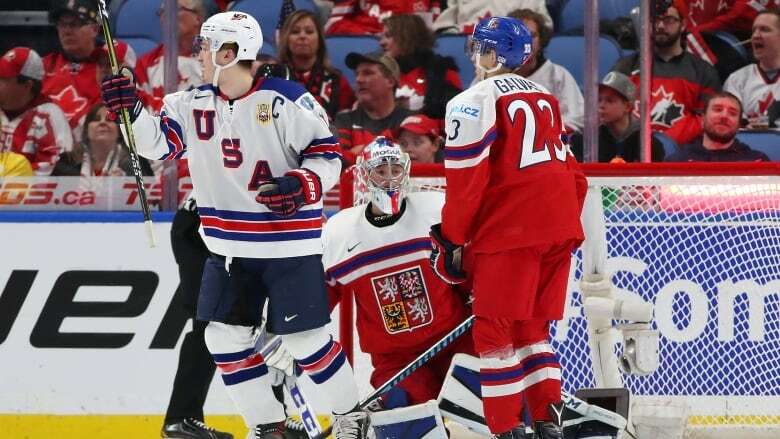 Off the second-period-opening faceoff, U.S. defenceman Scott Perunovich fired the puck into the Czech Republic zone, where Anderson stripped the puck from Martin Necas behind the net. Anderson came around the left side and fed Poehling alone in front. Bellows made it 5-0 by scoring on a penalty shot in which he drove in off the left wing, cut across the front of the crease before beating Skarek inside the left post. Bellows then scored his tournament-leading ninth goal with 59 seconds left in the second period to put the U.S. up 7-0. The Americans' special teams bounced back a day after giving up a pair of short-handed goals over a 38-second span in the third period against Sweden. Jake Oettinger finished with 28 saves, and stopped the first 13 shots he faced before giving up two goals on three shots in the first 2:11 of the third period.